Dr. Bjoern Brosch for his numerical simulation of grate firing systems for biomass combustion. 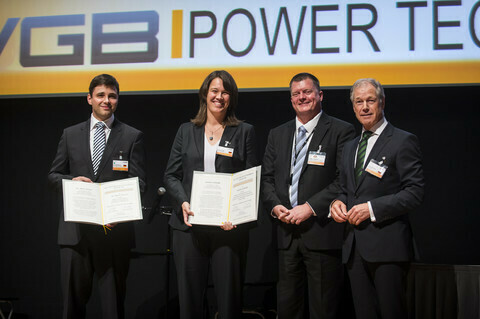 The Heinrich-Mandel Prize, endowed with a total of 10,000 Euros, was handed over by the VGB chairman on the occasion of the VGB Congress "Power Plants 2013" in Maastricht, The Netherlands on September 25, 2013. Gerd Jäger and Erland Christensen awarding the 2013 Heinrich-Mandel Prize to Sandra Schmidt and Björn Brosch.